A beautiful basket at a great price. This must have for the new mom comes with all the essentials for the newborns bath and more. There is also an assortment of coupons the new mom will surely use. Substitute with a bottle bag, at not extra charge? This adorable baby bottle bag is filled with lots of goodies for the newborn. Bottles, rattle, pacifier, teething rings and more. A great baby gift at an affordable price. This deluxe baby basket is a beautiful gift for the newborn. 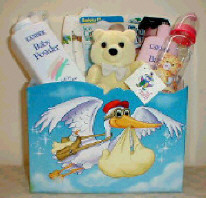 Basket contains baby powder, lotion, rattles, picture frames and more. The new mom will also get an assortment of chocolates, stationary and coupons.